Vienna Airport Transfer - Taxi, Bus or Train? Find the best transfer from the Vienna Airport to the city! This comparison will help you with that. The table with prices, links and information about the transfer by taxi, bus or train gives you an overview of the different possibilities. In the section short description you will find a summary with positive and negative points for each of the listed transfer options to and from the Vienna Airport. So it will be easy for you to make a decision between the comfortable taxi, the bus or the cheap train with prices starting from about 4 €. Schnellbahn / Railjet Train 15 / 25 / 30 min. 30 min. 4,20 € Wien Hauptbahnhof / Wien Mitte / Wien Meidling This train is the cheapest option. Air-Liner Bus 15 min. 60 or 120 min. 5 € Wien Erdberg / VIB Free with the Vienna Pass. Vienna Airport Lines Bus 45 / 20 / 42 min. 30 / 30 / 60 min. 8 € Wien Westbahnhof / Morzinplatz-Schwedenplatz / Donauzentrum ... 3 bus lines with 14 stops in total. CAT 16 min. 30 min. 11 € Wien Mitte Comfortable train with check-in counter at the station. CoolCab Taxi 15 to 50 min. - 25 € Any address in Vienna Reasonable price for up to 3 people. ATS Taxi 15 to 50 min. - 35 € Any address in Vienna With its own taxi stand direct at the airport. The station for the Schnellbahn and Railjet trains is located directly at the airport. The trip to the different stations in Vienna costs around 4,20 €. This is the cheapest possibility to shuttle between the city of Vienna and the airport. Additionally you may use the same ticket also for a ride with the metro. Simply enter the metro station of your destination when you buy the ticket for the train transfer. Tickets und further information is available at the OEBB Website. The airport station for the Air-liner bus is easy to reach upon arrival. It is located directly at the bus terminal in front of the arrivals hall in terminal 3 at level 0. The bus runs directly to the Vienna International Busterminal without a stopover. Right across the Vienna International Busterminal is the metro station Erdberg. From there, the metro line U-3 will take you straight to the city center. If you plan to visit some of the attractions, then you should take a look at the Vienna Pass. The pass includes a free transfer with the Air-liner bus. Tickets und further information is available at the Air-Liner Website. The Airport Line buses start also at the bus terminal in front of the arrivals hall at the airport terminal 3. 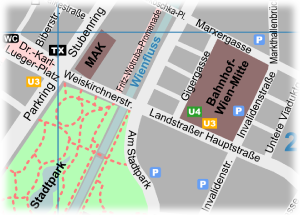 In total, there are 3 lines available with 13 stops all over Vienna. So you have the opportunity to get very close to your destination in the city without the need to change. Tickets und further information is available at the Vienna Airport Lines Website. The City Airport Train, short CAT, is a very comfortable train that takes you directly to the city center. The high-quality interior furnishings with sufficient space and the possibility of a City Check-Inn are included. At the City Check-Inn you have the possibility to check in your luggage up to 24 hours before your flight departures. Especially on late flights, this will give you the opportunity to enjoy Vienna without having to worry about your luggage. Tickets und further information is available at the City Airport Train Website. The CoolCab taxi is one of the cheapest taxi offers from the Vienna airport to the city. In the lowest fare category, the taxi will bring up to 3 people to any address in Vienna, at a fixed price. In any case you should make an order at least 8 hours in advance. Order possibility and more information can be found on the CoolCab Website. ATS offers the advantage of its own taxi stand directly at the airport. The counter is located in the arrivals hall. There you can simply order a taxi and pay immediately. Also here you will be charged with a fixed price for the whole of Vienna. Up to 4 people are allowed in the lowest rate. Order possibility and more information can be found on the ATS Website. All flights for your trip to Vienna arrive at the airport in Schwechat. This is the only international airport for the city. The distance to downtown is approx. 25km. Among the most important airlines in Vienna are Austrian Airlines, Lufthansa and Eurowings.